Dip’s namesake French dip. Photo courtesy of Dip. Dip’s veal osso buco with potatoes au gratin with Gruyère. Photo courtesy of Dip. 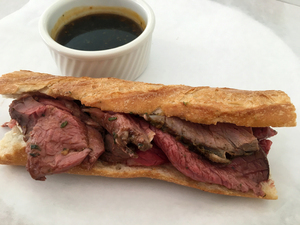 Opening this Friday December 9th in North Beach is ~DIP~, the French dip-centered spot I mentioned earlier this year. Mahmoud “Mo” Khossoussi—owner of North Beach’s Maykadeh and Mo’s Grill, who is in his 70s and can’t stop, won’t stop—and his daughter, creative director Haleh Cunningham, have collaborated to open this bistro based one of their favorite family dishes. Look for a menu with a variety of French dip sandwiches, all served on Acme bread with house au jus: organic roast beef, organic slow-roasted pork shoulder, organic porchetta alla Romana, leg of lamb, free-range roasted chicken, and a vegetarian version with oven-roasted tomato, fresh mozzarella, and arugula pesto (all $11-$13). 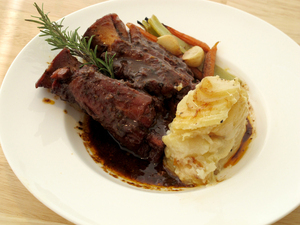 There is also a bistro delivery menu that will begin January 3rd, perfect for those nights when you don’t want to cook, but a plate of beef bourguignon or a roasted half chicken with potato au gratin and roasted vegetable mirepoix and Acme bread on the side sounds like the most amazing thing to have show up at your front door. There are also pasta dishes, sides, and of course, French dip sandwiches. Delivery is free for orders $40 and up to most neighborhoods in San Francisco (there is a 35-year-old delivery system in place from Maykadeh and Mo’s Grill). The shop is reminiscent of a butcher shop, with lots of white tiles, plus brass and wood. Mo and Haleh will be donating half of the proceeds from the opening day of Dip (Friday December 9th) to the victims of the Oakland fire and their recovery process. Open daily 11:30am-10:30pm. 1318 Grant Ave. at Union, 415-757-0775.